Prof Dr Uday Salunkhe, Group Director, WeSchool felicitated with 'The Best Teacher's Award' by Higher Education Forum on Teachers' Day , 5th September 2011. Higher Education Forum recognized the efforts of Prof Dr Uday Salunkhe,Group Director,WeSchool for his immense contribution to management education in the country. He received the ‘Best Teacher Award’ under the special category of ‘Global Leadership’ for his initiative and role in establishing higher educational institutions with global perspective and vision. 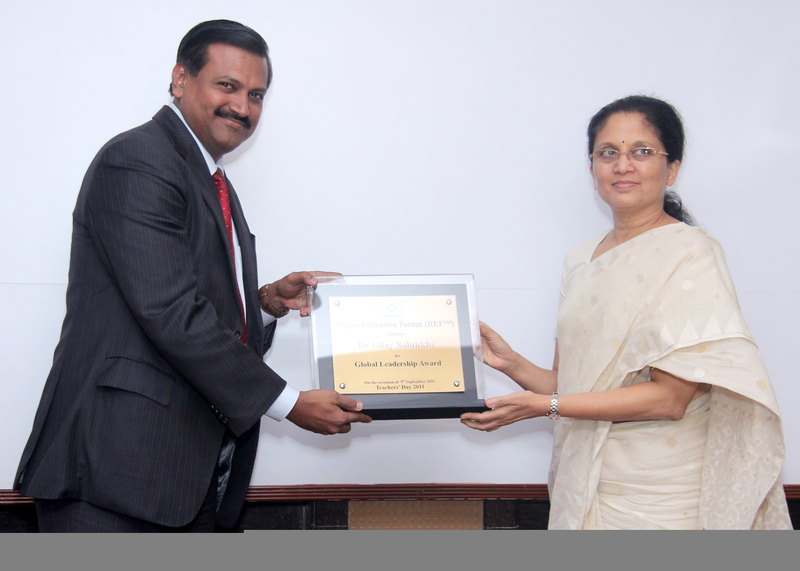 Dr Salunkhe received the award from Ms Jaya Row, Founder of Vedanta Vision. Other academicians present on the occasion included Dr Indu Shahni, Principal, H R College of Commerce, Dr Kondap, Chairman, Western Regional Committee, AICTE , Dr G Natrajan, Vice Chairman & CEO of Zensar Technologies and Prof A K Sengupta, Founder of Higher Education Forum. “An institution should constantly strive to explore leadership elements in its teachers who are the driving force of that organization. I am extremely honoured by being associated with this profession of teaching for past several years.” said Dr Salunkhe as he accepted the award. Dr Salunkhe further said that our leaders need to transcend the geographical boundaries, taking the socio-cultural diversity in their stride. The global leaders have the entire world as their playing field as they usher in change and prosperity. Highly successful leaders are blessed with clarity of purpose, maximize their significance; significance is adding value to others, giving back to society. They also have the indomitable courage of conviction to stand by their belief system even in the face of intense criticism. Global leadership has only one culture and that is performance-based culture. Global leaders and entrepreneurs live, sleep and breathe the triple bottom line (Profit, People and Planet). Efficacy and performance remain the primary touchstones. Broaching the shrinking globe phenomenon, Dr Uday Salunkhe said that for success as leaders and global players we need to free ourselves from the boundaries and labels that stifle our growth to full potential. A global leader, according to Uday Salunkhe, has to take his organisation towards the set goals, navigating through the diversity and transcending all limits,geographical or otherwise. Higher Education Forum (HEF) is a voluntary non-profit group of individuals as well as organizations representing various stakeholders directly or indirectly associated with any form of higher education in India. Group has over 1600 members across the country.